There have long been rumours of Goshawks breeding in the county, most reports coming from the vicinity of the dense conifer plantations of Macclesfield and Delamere Forests. Published records are few, however: submissions are assessed by the County rarities panel, and sightings are frequently not described to their satisfaction. 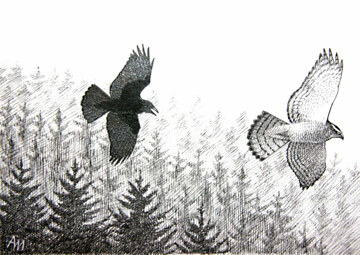 Goshawks are big birds, with many females being larger than Buzzards. Their sexual size difference means that males are not much more than half the weight of a female, but even so, a male Goshawk is considerably larger than any female Sparrowhawk, and three times their weight (Marquiss & Newton 1982). Knowledge is sketchy, but the current status in the county is probably much the same as during our First Atlas, when breeding was confirmed at three sites, at one of which the nest contents were regularly taken by man. RSPB reports show that even now, Goshawks are close to the top of the list of species illegally targeted, by egg-collectors, would-be falconers and gamekeepers. At least some of the county’s Goshawks have escaped or been released from captivity. Deforestation and persecution led to their extinction as a British breeder in the 1880s and there was no known natural breeding in England in the first half of the 20th century until resurgence of interest in falconry in the 1960s and 1970s led to the import of large numbers of birds from central Europe and Fennoscandia. The accidental and intentional release of some of these birds and their captive bred descendants provided a foundation for the current feral breeding population (Marquiss & Newton 1982). The origin of birds currently seen in Cheshire is unknown but the median recovery distance of 47 km (Migration Atlas) could encompass dispersing birds from nests in the South Pennines or Wales. Goshawks display prominently over their woodland territory but these may be unpaired individuals as there is a significant pool of prospecting first-year birds: they can breed at one year of age, although not very successfully. Birds start breeding early in the year, often nest-building in February. There is not much suitable habitat in the county, Goshawks occupying extensive areas of mature woodland. They favour more open stands of woodland than Sparrowhawks, with a mean distance between trees from 2.5 m up to 6 m or more, presumably because their larger wingspan means they need wider flyways (Newton 1986). The smaller bird uses the denser woods, thus achieving ecological separation. Goshawks do not tolerate Sparrowhawks, frequently killing them, and Sparrowhawks instinctively avoid areas with the larger bird present. So, in a naturally balanced environment, Goshawks act to limit the population of Sparrowhawks. They probably also keep in check the burgeoning corvids, although their main prey is pigeons, gamebirds, rabbits and squirrels.